Ina Garten’s white chocolate bark is the perfect recipe for the person with no time, or the one who can’t cook. It is foolproof. It is fast. It is easy. It is beautiful. This treat is great for the upcoming holiday season. The combination of flavors and colors is both tasty and beautiful, and no one will know just how easy it was to make. You can keep the ingredients on hand at all times so when you’re invited to a party last minute you’ll have something to make and bring. I bring a dessert to our church bazaar each year (last year and the previous year I made these) to sell in the sweet shop. This year I was puzzled on what to make as I haven’t really been in the kitchen nor do I have the time to be (yet). I was feeding bambino and watching Barefoot Contessa on the Food Network when she made this dessert and I immediately knew I would make it for church. Verdict? Foolproof, fast, east, beautiful, and most importantly, delicious. The original recipe can be found here. Note: On TV she used pistachios and in the written recipe used walnuts. I preferred the pistachios for their beautiful green color. It was the right choice. What a fun holiday version! 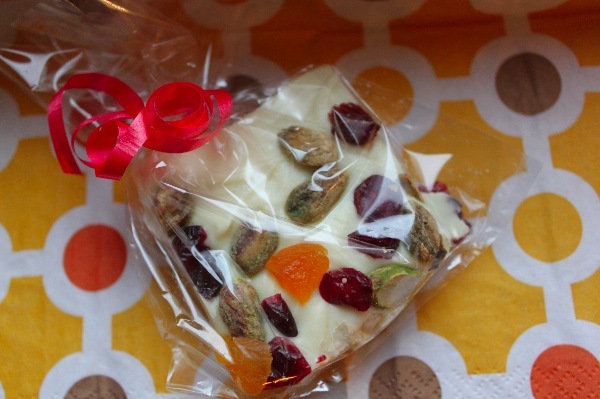 I made white chocolate bark today too….love it! I made this recipe last year for a lot of holiday gifts. It’s so easy and a definite crowd-pleaser! So pretty! Hope you guys are doing well! These look great- ever since you’ve posted the first chocolate dipped pretzel recipe they have been a staple in my holiday cookie boxes, maybe it’s time to switch it up a bit! Thank you for sharing. What a great idea! I just added this to my Christmas ideas list. It’s perfect- looks delicious and doesn’t take too long to make (which is exactly the kind of gift/dessert idea I’ll be needing this Christmas season). That looks delicious and so festive! I’m definitely trying this! I saw the episode where she made this and thought it looked so yummy! I love the idea of the chew from the dried fruit.